General conference is a fantastic opportunity to sit at the feet of living prophets and hear the word of the Lord. By preparing early, we can create a culture of family attention and participation. 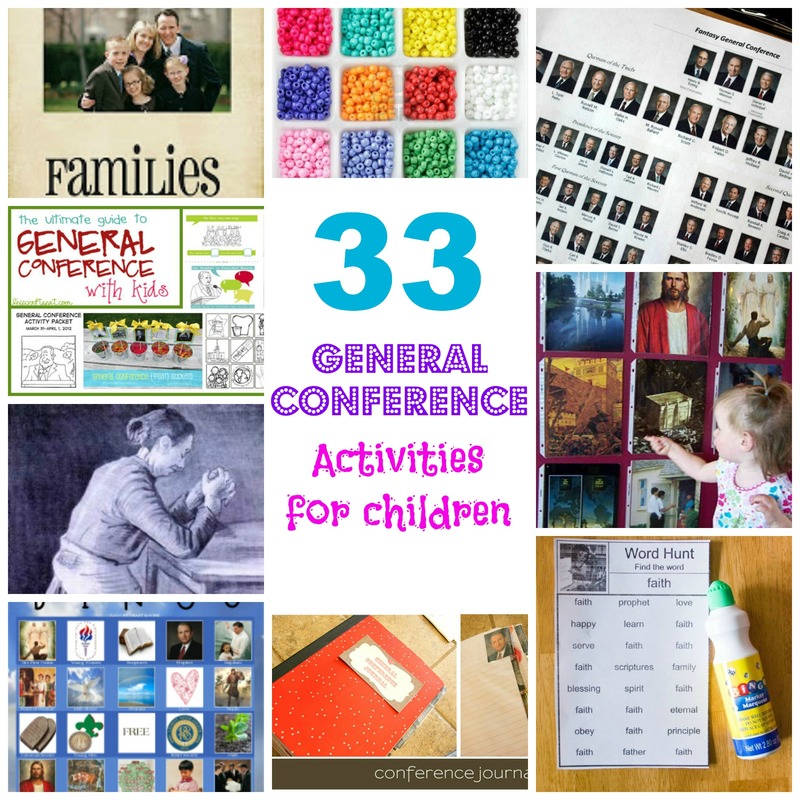 Here is a collection of activities you can use to help engage your children in the general conference experience. Each of the pictures links you to the original site and post where I found the idea. Click through to those sites to learn about each activity. Before you get too carried away, keep this in mind: Just pick a few activities that seem like a good fit for your own children and family. If you try to do too much, you will stress yourself out and then find yourself highly disappointed and annoyed when it doesn’t go like you planned it all out in your mind during your sleepless preparations. In the end, conference is supposed to be a reverent learning experience and not a three-ring circus, so work hard to create a healthy balance. 1. Countdown to conference FHE Activity. And a Dieter F. Uchtdorf talk: “General Conference—No Ordinary Blessing” Great ideas about preparing spiritually. God bless you as you prepare for and participate in General Conference. I know God lives, that his Church has been restored, and that as we act upon the things we learn in conference, we will be blessed with power and protection and treasures of knowledge. I think I just officially go overwhelmed! 🙂 But I am excited for conference! I’ve got work to do! I love your prepare yourself post! It is greatness! We do a couple apostles for April conference because we also have Easter to contend with usually and we do all of the apostles for October conference. We were having a tough time enjoying all of conference because the children all needed attention at one time or another,so I spoke with my daughters about the conference packets and notebooks I had pinned. We tried them in Oct. For the first time. The children enjoyed them, and we were so happy with the results. Well worth the effort. Even the two year old was happier and more occupied and interested. Thank you for all your ideas. I will be sharing them! Great ideas. Found you on Mormon Mommy Blogs. Just what I was looking for today. I have a Mommy Blog too and I think this is great. Thanks for sharing. Thanks for the ideas! I’m going to try the baggie idea this year–I did a version of it last year, and I think it went well. and then I’ve done a conference activity scavenger hunt. (So, when they are listening to a talk on faith, rather than getting candy for the word, we’re planting seeds in cups, etc.) I’m also going to use the primary print question page above. Brilliant. Can’t wait to hear how your weekend goes!